Heat oil in a pan, add mustard seed, fenugreek seed, channa sal & allow to temper. Add chopped shallots & sauté. Add chopped tomato , methi leaves & sauté. Soak the tamarind in water & squeeze the juice from it to make 3 cups. Add tamarind water sambar powder,salt & allow to boil. Add cooked tuvar dal & mix well. Allow to cook until done & serve with hot rice. Lovely sambhar dear.It has a powerful cooling effect and good for health. மணமான மனதுக்கு இதமான வெந்தயக்கீரை சாம்பாருக்கு நன்றியோ நன்றிகள். பாராட்டுக்கள், வாழ்த்துகள். பகிர்வுக்கு நன்றிகள். 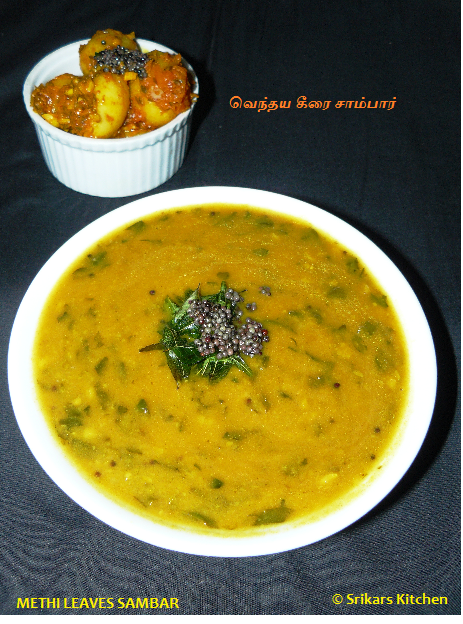 flavorful sambhar...love to eat with hot rice and potato fry.. I love sambar and this looks so good though i have never made sambar like this. Very aromatic and delicious sambar, fingerlicking food. sounds new but luks hot n spicy really ncie..